The first iteration of our bedroom is complete. It's basic: old table, chair, small old bookshelf (with lots of baby stuff), big old cupboard (left here by previous tenants), and bed (made by Eug). We painted a very old decrepit chair purple. The bookshelf was attached to the wall of the kitchen (?!) so we took it down and it has our few books, albums, and all Tiny Blob's blankets, wipes and diapers. 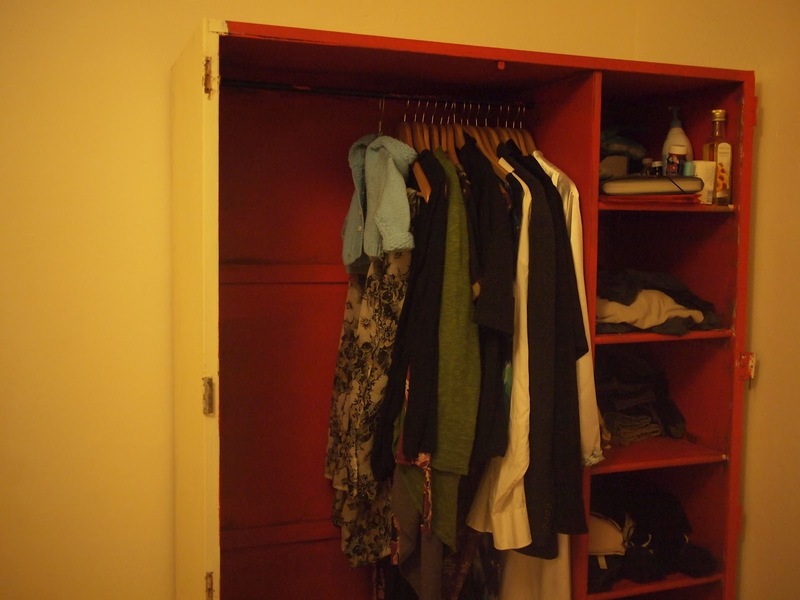 The tenants left a broken cupboard- we painted the inside of the cupboard red and removed the doors. It's big enough for Eug and my clothes, as well as our file, toiletries for Tiny Blob, and a growing collection of Tiny blob's stuff. Now to the exciting stuff. In our search for a bed in South Africa, we became very discouraged that there wasn't a lot of thought about what was in the mattresses. Salespeople focused solely on "which bed makes you feel good?" They insisted memory foam and latex were the same thing. It isn't. Latex is made from rubber (which can be both sustainable and make a good, healthy mattress), memory foam is a kind of plastic. So we decided to order foam ourselves- at least we know what we're getting, there's no heavily glued chip foam filler, and it's cheaper: 7cm of Memory Foam on top of 13cm of dense, firm foam. Plastic, yes, but no glue, no filler, no fire retardant. Better than the best quality foam mattress in the showroom, as far as we could tell. The factory seemed responsible and well managed. We ordered a basic cover that encloses the foam, and is waterproof. Then Eug made a bed frame. I love that the bed seems to float, and that we can store things underneath if we have to. 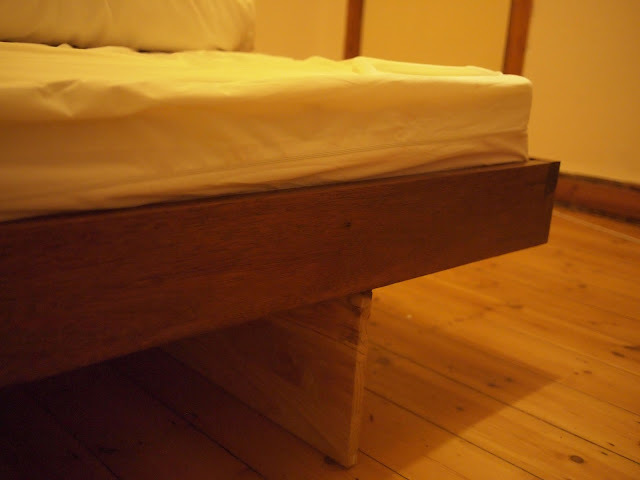 The bed frame is basically 4 pieces of hardwood, standing on top of 3 pieces of South African pine (One lying in the middle of the bed, two lying perpendicular). 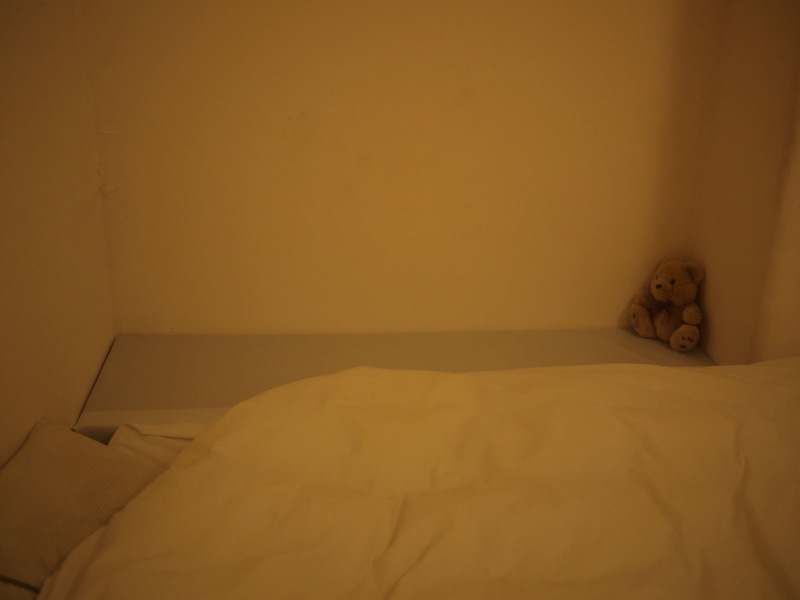 The mattress rests on pine slats. It's beautiful, supportive, simple and comfortable. We're hoping to remove Noah's bedroom door and make a headboard with it. Eug built support slats that rest on the wall and the bed frame (no space for him to fall into cracks), and I went out and bought a piece of dense, firm foam that fits the space exactly. I covered it with waterproof material from Fabric World on Wynberg Main Road. It allows the baby a space where he's slightly removed, and where he's in no danger of being smothered by our duvet. I'll write in a few weeks about research on SIDS and the ways in which I think it's possible to embrace the spirit of the multitude of U.S. laws around crib mattresses, drop side cribs, stuff in the crib, strangulation hazards and the like, without getting totally paranoid and buying new things unnecessarily. A space of his own. Hey, that's brilliant! Where did you get the foam? I'm going to need a new mattress before the arrival of my blob, and think that's a fabulous way of going about it! We learned that the key to mattress longevity is foam density (dense foam can be hard or soft). We bought the hardest, firmest foam for both us and the baby, though ours has the memory foam on top of it, which softens it while leaving it supportive. Do you need a mattress for both you and the baby? 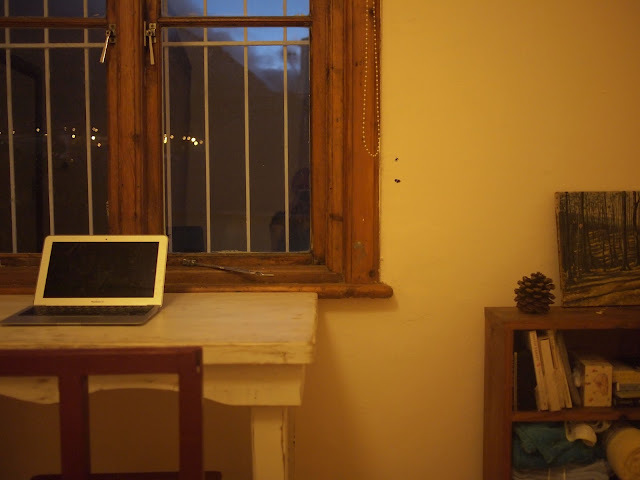 I'll write a little about it later, but having a corner with wall on all sides (because of a chimney) allowed us a safe space in the room. The baby can just roll onto it, or stay in our bed if the duvet isn't in the way.